again, I literally force myself to, as Max so succinctly put it, ‘be still!’. Be still — how hard can that be? consciously and wholeheartedly, be still. But, for the very same reasons, it is that much more important to do it. warm latte, writing in this blog. leche simmers to life on the hob. above the tops of the cans at all times. them off, and enjoy the uncomplicated divinity called dulce de leche. has been likewise performed by your forebears. was in front of us, content. **It must be shared that I used both Milkmaid and Carnation condensed milks, and the can of Carnation was still liquid while the Milkmaid was perfect (and it’s what you see pictured here). Milkmaid is what my father and grandmother use, and what my father strictly counseled me to use. Apparently with good reason. I would love to try this one and use it as a palaman to a hot pandesal! Yum! A real treat! That spread is soooo luscious looking. I love your writing. 🙂 Always have. Still do. My mother cooks 4 cans at a time in a huge pot. She also uses Milkmaid (and no other brand) for dulce de leche. am so glad I found your blog. really enjoyed reading it, such brilliant writings. 🙂 thank u as well for sharing your recipes. keep up! cheers! Hi Ella! Go for it! And yes, hot pan de sal and this would be divine! Hi Angelika!! So wonderful to see you here and to hear from you! I would absolutely love to have a chatty moment with you over coffee *and* cake! Maybe one day right? 🙂 Big hugs!!! Hi Katrina! To have not one but two writers say that is making me go all warm and fuzzy!! Thank you! Yes, now I remember — that is what my dad says as well, because Milkmaid uses real milk 🙂 He knows his dairy! I've always wanted to try this…. But we don't have sweetened condensed milk here….. It looks wonderful! Are you serious? This is how you make dulce de leche? That's it? I thought it was a more complicated process, but apparently it's not. I'm gonna have to try your recipe, and hopefully – cross my fingers – I don't F it up! Hi Midge! Just had a spoonful and yes, the flavor is truly amazing 🙂 Hope you are feeling better! Hi Jen! There are other ways to make it but this is how my family has made it since the time of my great-grandmother 🙂 It's that easy! My friend who now lives in Cost Rica just sent me ready-made Dulce De Leche. You've reminded me that I need to use them for something. It's wrong to have it sit in the pantry unused. I am also reminded to hunt this down while I'm here in the US and bring home some cans! ahhh memories of childhood! milkmaid is really the way to go, i agree. in grade school, i used to spread this over Hapi biscuits and layer about 4, top with raisins, let cool for an hour and tadah…heavenly! hi joey! yes, i've seen chef michael of "chef at home"do this in one of his episodes and he prepped more than one can ( he says you can keep this on the shelf for an indefinite period of time). makes it all worthwhile and saves on money on lpg or electricity. thanks for sharing. Hi! How long would this dulce de leche keep once opened? how about if left in unopened cans? Hi Anonymous! I can't say for certain but unopened it should last for a while in your pantry. If opened I usually store it in the fridge…but it is usually all finished in a short time! Yum! How cool is this. Had a sudden craving for Dulce de Leche after reading your blog. Yummy! Since I only had 1 can of condensed milk, and didnt want to wait for 3 hours. I tried the David Lebovitz water bath method and it worked well. Took only 1 hr and 15 mins in the oven. Suggest you give it a go if you are in need of a quick pick me up. You can even roast your chicken/ pork at the same time to save energy and have both mains and dessert. BTW love all your recipes and watched your lovely clip on tv. Take care. Ma Barker. Hi Ma Barker!! Thanks for the tip 🙂 And thanks for leaving such a sweet comment! Hope to see you soon! Take care!! You've brought back so many of my own memories of busy, I think I heaved a sigh on your behalf sitting here and imagining your few moments of quiet. 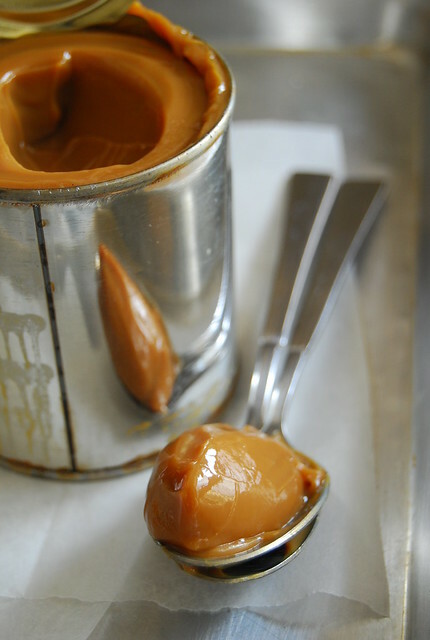 I've made dulce de leche like this and you are so right — divinity in a can. I love how you referred to it as Uncomplicated Divinity… That's exactly what dulce de leche is! Now you got me craving… And yes, I agree… Milk Maid all the way! Great post, Joey! Warmest regards! Hi Arlu! Isn't it? You are just a spoon away from satisfaction 🙂 Thanks and warmest regards to you as well!! Hi ChichaJo! I've been reading through your blog for some time, thanks for your wonderful posts! I'm relatively newlywed, so I get a lot of [cooking]inspiration from your blog. Question: if i'm to make just one can of dulce de leche, do I need to wait all three hours? Thank you! We don't have either of those brands but a different one. I've got to confess that I'm one of those chickens afraid the can will explode but then I didn't know that keeping the can covered would prevent that happening. No more excuses left! My Lola always insisted on Milkmaid, too, for all her condensed milk needs. I guess if it's good enough for our lolas, it should be good enough for us. Looking forward to giving this a shot, too. Have you tried dulce de leche on popcorn? One of our faves! Hi Mich! Have never tried that…sounds delicious! Dulce de Leche! Yummy. Have you tried the Bacolod version, Dulce Gatas? I figure it is the same thing but the DG I've tried seems paler and your DDL looks much smoother. That looks delicious! i think that i am going to have to try that out right now.